Here’s another easy and delicious way to enjoy some heart healthy salmon…with a fantastic Romesco sauce pour over it! Not only is this an incredibly flavorful salmon recipe that is just 7 Points per serving, but it’s loaded with nutrients and vitamins too. I used zucchini in the recipe, but you can grill just about any other vegetable you want, if you prefer something different. I’ve made it with eggplants, asparagus and sauteed spinach, and it worked really with all of those. The Romesco sauce is really versatile and would also work well over chicken or eggs. And if you want to spend a few extra points, serve this salmon recipe over a grilled baguette slice…it’s soooooo good! This would make the perfect summer Weight Watchers recipe for that outdoor BBQ, and I definitely recommend giving it a try. it can also be done easily on a grill pan, if it’s too cold or rainy outside to barbeque. Enjoy! Spice up some grilled salmon with this traditional Spanish Romesco sauce. The sauce is zesty and flavorful and will definitely give that salmon and grilled zucchini a nice kick. This makes a wonderful summer Weight Watchers recipe that is delicious and healthy. In a food processor, combine peppers, tomatoes, garlic, vinegar, almonds, paprika and salt and pepper. Set aside. Lightly mist salmon and zucchini with an olive oil mister or non-fat cooking spray, and then season with additional salt and pepper. Grill salmon and zucchini, turning once halfway through, until salmon is cooked through, and zucchini is tender, about 3-4 minutes on each side. 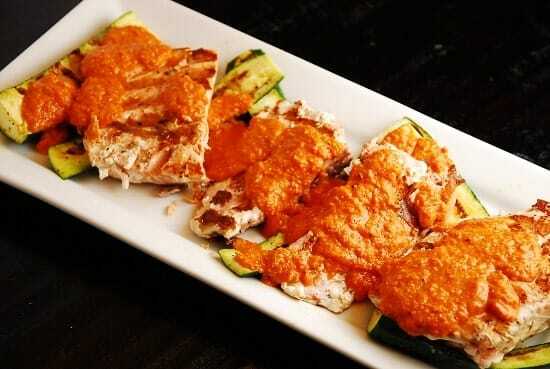 Transfer salmon and zucchini to serving plate, and pour the red pepper sauce (the Romesco sauce) over top of it. Serve immediately. Loved it! soo delicious exactly as is. I prepared this on the George Forman indoor grill. Would be a great party favourite too. This is delicious! I admit I threw in half a large shallot, extra garlic, and more almonds, but this sauce was drool worthy. Make sure you’re using really good (rather than cheap / fishy-tasting) salmon. Just last evening, my husband mentioned that we should have salmon for dinner tonight. So, when this came in, I immediately emailed it to him to see if it sounded like a good recipe. It passed his initial review! We made it tonight and it is amazing! All the kids loved it too. Only bad thing is we stared eating the sauce on bread, tortilla chips. We dreamed of eating it on pasta….so not WW friendly, but if I can make it and eat it with the healthy stuff, the kids can finish it up on the not so healthy stuff!